Next Wednesday, being the first Wednesday of the month, there will be a Latin Mass at 6.30pm at the Church of St Charles in Hull. It is, of course the eve of the Feast of the Purification. Last week, I attended a talk given by Fr James Mawdsley FSSP at the Church of St Mary in Warrington. Before training for the priesthood at Wigratzbad in Germany, Fr Mawdsley was a preominent human rights activist, with a special interest in the oppressed ethnic minority communities in Burma (or Myanmar). As a result of his campaign of protests, he had spent the best part of two years in prison in Burma in the 1990s. Fr Mawdsley has just returned from a fortnight in Burma, when he travelled extensively in the country visiting Catholic shrines schools, orphanages and churches. He was also able to distribute some money to good causes. The talk gave an insight into Catholic life in Burma, and I was surprised to discover that there were so many Catholics in the country. 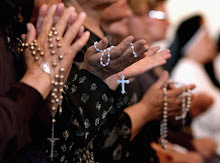 The Catholic population is estimated as being between 500.000 and 800,000, and is growing steadily. Fr Mawdsley thought the latter figure to be the more accurate. That is around one and a half percent of the total population. Most Burmese are Buddhists, with the next largest group being Animists. There are some large and impressive churches and cathedrals, although many of the churches are very small and sometimes very basic buildings. Apparently there is a good supply of priests, although the number of young men entering seminaries has declined in recent years. Fr Mawdsley was able to celebrate the traditional Mass every day, and said that he was warmly welcomed everywhere that he went. He said that the Burmese were very impressed that he, and the seminarian who was his travelling companion, wore the cassock. That practice has almost completely died out in Burma. 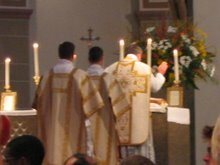 He also found that many of the young priests were interested in the Latin Mass, and would be keen to learn to say it if they had the opportunity. I immediately thought that the decline in priestly vocations might be reversed by the introduction of one ofthetraditional orders into the country. My hope is that it may be possible for the Priestly Fraternity of St Peter to establish an appostolate in Burma before too long. From what Fr Mawdsley had to say, it would seem that the Catholic community out there would welcome such a move. There will be a Sung Latin Mass at 6pm on Friday 6th January, the Feast of the Epiphany, at St Wilfrid's Church, York.